Terribly sorry about this late update! Thank you everyone for coming out lately, the last couple of weeks have seen the numbers start to bounce back after quite a dip. I guess tea and coffee was all it took? Our model for this coming Monday (the 3rd) will be Ron. The following week will be with a new model model, Shontay. Tracy’s Drawing School will be on again tomorrow (the 2nd), and from then through to the end of September, anyone who heads out will get a stamp for my group on their card (like what I did with Sebastian’s Mt Hawthorn group when it first started). Head on over to drawingschool.com.au to find out more about her group. As the numbers have started to slide back down for Sebastian’s group, we’ve decided to reinstate the stamp system at his group through to the end of August, so get out there people! The Curtin Tuesday night group will be back this week (the 4th) after a brief hiatus with what sounds to be a pretty cool clothed session. Earlier this year I did a two week workshop at The Art Space Collective in Scarborough. Well I’m doing it again, and due to feedback it’s changed a bit. First off, it will be over four weeks, and be on Saturdays from 2-5pm (as opposed to middle of the week during the day as it was before). The first two weeks will be without a model as it covers drawing techniques and the basics, while the following two weeks will have a model to apply those techniques on in an instructed environment. Anyone interested can head over to https://theartspacecollective.com/bookings to sign up. Keep drawing, but please don’t hurt people while doing so! Categories: Curtin, Drawing School, Drink and Draw, info, Instructed Session, Mt Hawthorn, Ron, Shontay, The Art Space Collective, UWA | Permalink. A late model update and a new drawing group! Sorry about my tardiness of late (why does it take so long to catch up on things after coming back from vacation?)! This coming Monday (the 22nd ) we’ll be having in one of our regular models, Amy, along with new to the scene Molly! In other news, I’ve recently received some thorough information on the Thursday morning sessions and I’ll be updating that on Monday. 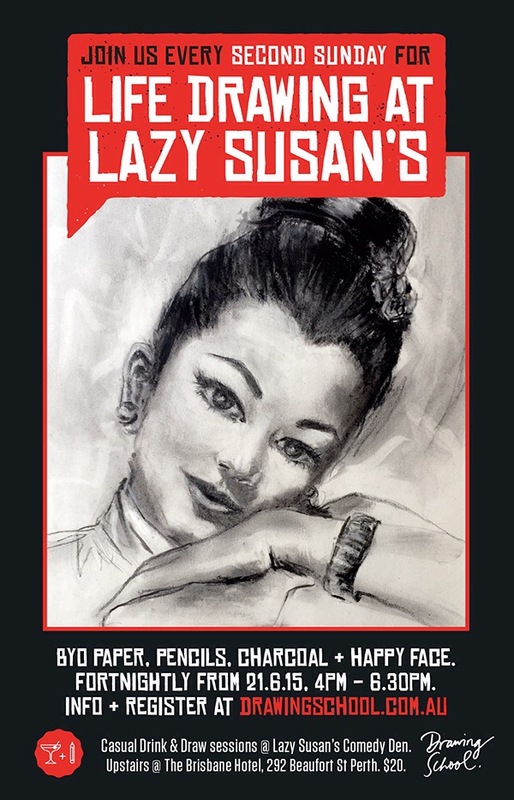 Starting this Sunday June 21st, we kick off our fortnightly Life Drawing sessions at Lazy Susan’s Comedy Den, upstairs at The Brisbane Hotel. The session will consist of timed poses from warm-up gesture drawings to longer poses, in a relaxed, friendly atmosphere. Everyone welcome, but please note these sessions are directed to designers and those with some life drawing experience, as sessions are not formally tutored, although plenty of encouraging guidance from me, and a brief show & tell at the end. Fun! You’re welcome to bring a beverage from the Brissie downstairs (encouraged, actually!). WHERE: Upstairs at The Brisbane Hotel, 292 Beaufort St, Perth (stairway near the pool tables). Plenty of adjacent parking. BRING: paper, charcoal, pencils, kneaded eraser (see drawingschool.com.au/FAQ). COST: $20 cash (no eftpos). You can also visit her site drawingschool.com.au for more info. Categories: Amy, Double session, Drink and Draw, Molly | Permalink. Categories: Drink and Draw, info, Starting From Now | Permalink.